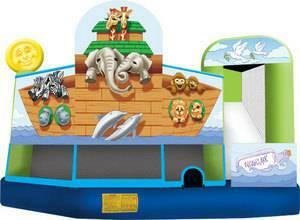 The Noah's Ark 5-in-1 combo bouncy castle will bring in attendants, two by two! Show off the story of Noah's Ark at your next event, with endearing artwork that features pairs of zebras, hippos, dolphins, elephants, giraffes, monkeys and lions. The bouncy castle is sure to entertain as kids of all ages can participate in five different activities for hours of Biblical fun. The 5-in-1 bouncy castle features a smiling, three-dimensional sun and two doves carrying olive branches above the sleek and slick slide.